Anyone that knows me knows that I love to cook. After sharing recipes on my lifestyle blog The Glamorous Gleam for almost 10 years, I’ve finally decided to start a blog dedicated to my love for cooking. You can read a little more about me here. But in the meantime, let’s get right into the first set of recipes. Yup, you’re getting three recipes out of the gate. I’ve recently become addicted to vegetable roti from a local neighborhood restaurant. My usual choice is chana, which is curried chickpeas & potatoes. One night I decided to be adventurous and try the vegetable roti. Which to my surprise was my beloved chana with the addition of bhagi (spinach) and pumpkin. It was love at first bite. Especially topped with tamarind sauce and pepper. I found myself going back every week. This was not a good thing as firstly, I prefer to cook most of my meals at home. Moreover, I’m attempting to minimize my gluten intake, and roti is a gluten bomb. Now usually when I fall in love with a takeout dish I figure out how to make it myself. I already know how to make Chana (recipe coming soon). So I just had to do some research to figure out the key spices to use for the Caribbean style spinach & pumpkin. 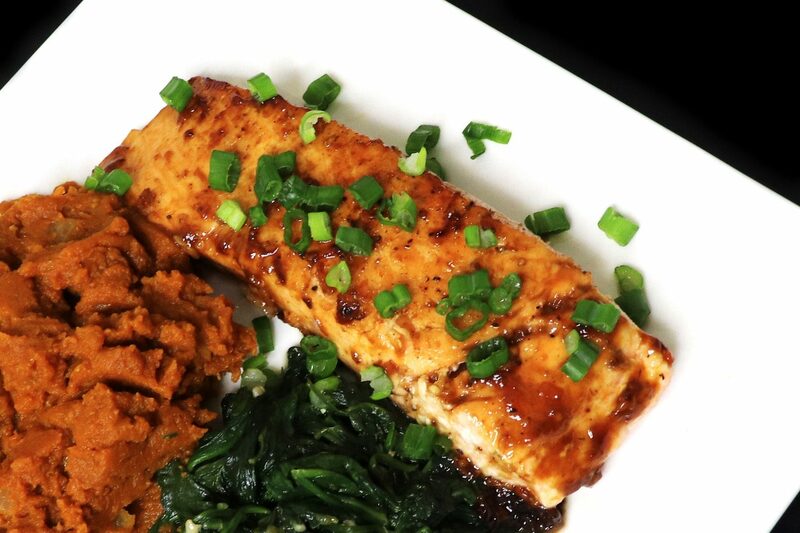 The Tamarind Salmon was inspired by the tamarind sauce and pepper. It’s a juxtaposition of sweet, sour & spicy. The Meal turned out amazing. Now I just need to find a good Gluten-free Roti Recipe. Inspired by the flavors of the Caribbean. 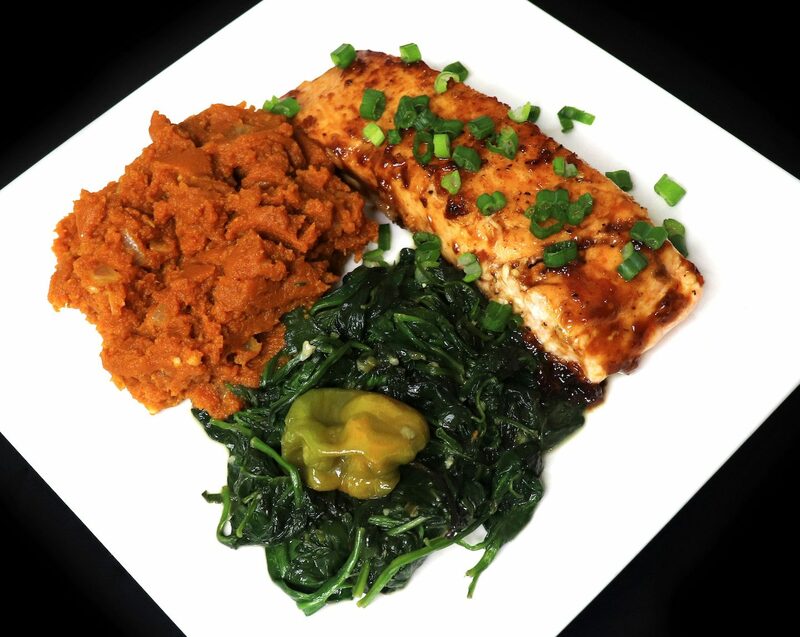 Tamarind Salmon, served with Coconut Spinach & Trini Style Pumpkin! To prepare the Tamarind Salmon, first you’ll need to prepare the glaze. Mix the tamarind concentrate and maple syrup with the chili garlic sauce, and a dash of ground ginger. Add more or less chili garlic sauce depending on your heat tolerance. Set the glaze aside. Wash the fish with lemon juice and water, and pat dry. Now season the fish with the sea salt & black pepper, and coat with half of the glaze mixture. Heat a cast iron skillet and add the coconut oil. When the oil is hot, add the salmon fillets to the pan and sear on both sides. Then add the rest of the glaze to the pan, coating the fish thoroughly, and let cook for a minute on each side until the sauce thickens. 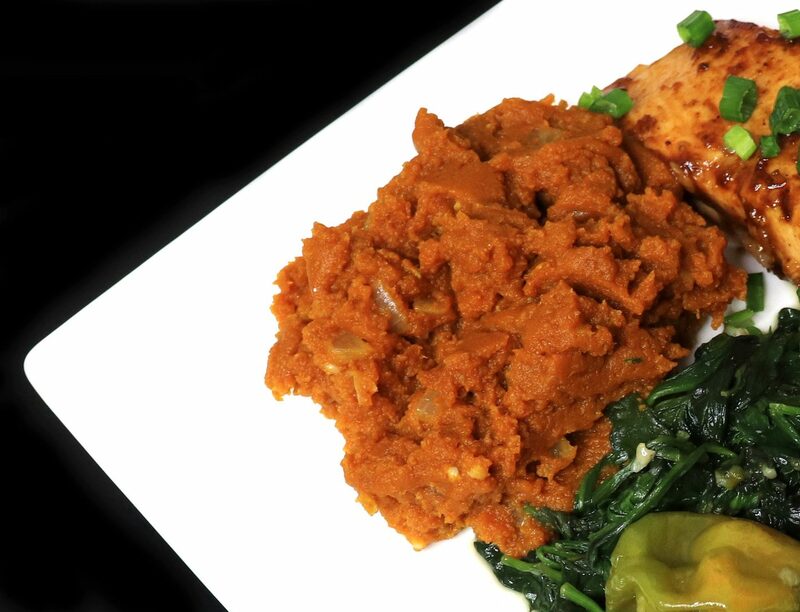 To prepare the Coconut Spinach, heat the coconut oil in a non-stick pan and add the chopped scallions, minced garlic and scotch bonnet pepper. Saute until the garlic is tender. Add the baby spinach and season with sea salt & black pepper, then cook uncovered until the spinach cooks down and the water evaporates. Now add the coconut milk and cook uncovered until most of the coconut milk is absorbed. Add additional salt & pepper to taste and turn off the heat. To prepare the Pumpkin, heat the coconut oil in a non-stick pan and add the chopped onion and garlic. Saute until the onion starts to caramelize. Add the can of pumpkin and brown sugar. Stir until all ingredients are thoroughly combined, then turn down the heat and cook covered on low until heated all the way through. Season to taste with cumin and sea salt, and turn off the heat. You may also add cayenne pepper if you’d like the dish to be spicy. 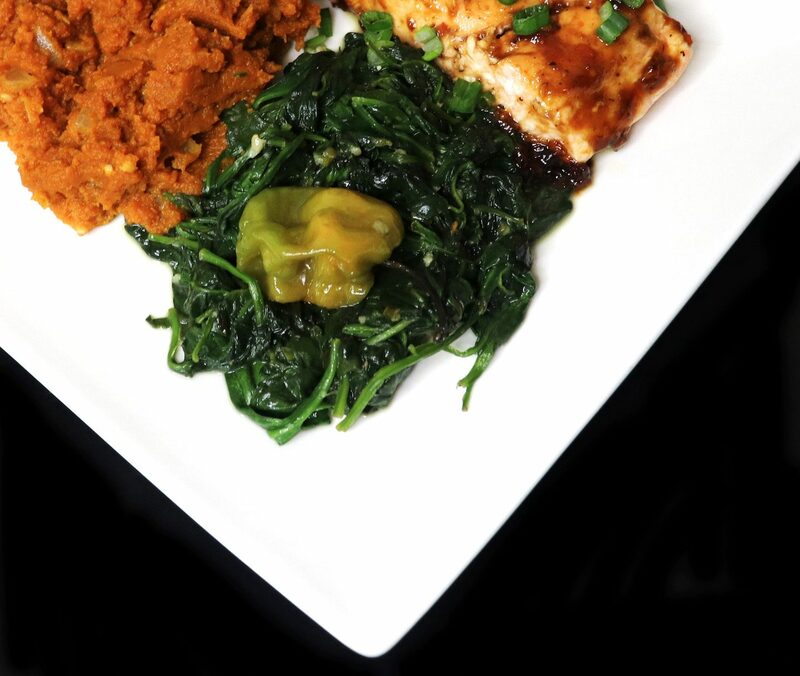 Plate the Tamarind Salmon along with the Coconut Spinach and Pumpkin. Garnish the salmon with chopped scallion. Enjoy! 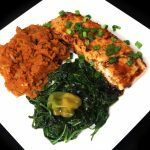 See how I made this dish, along with two other complete meals for Sunday Meal Prep. I season my food to taste, so the measurements may not be exact. Feel free to adjust according to your own tastes.